With a price tag starting just under $30,000 after the federal tax incentive and the best range of any mainstream non-Tesla electric vehicle on the market, the 2017 Chevrolet Bolt will soon be here. General Motors hopes that the Bolt will live up to the wild predicted sales numbers, so before it arrives, here is everything you need to know. 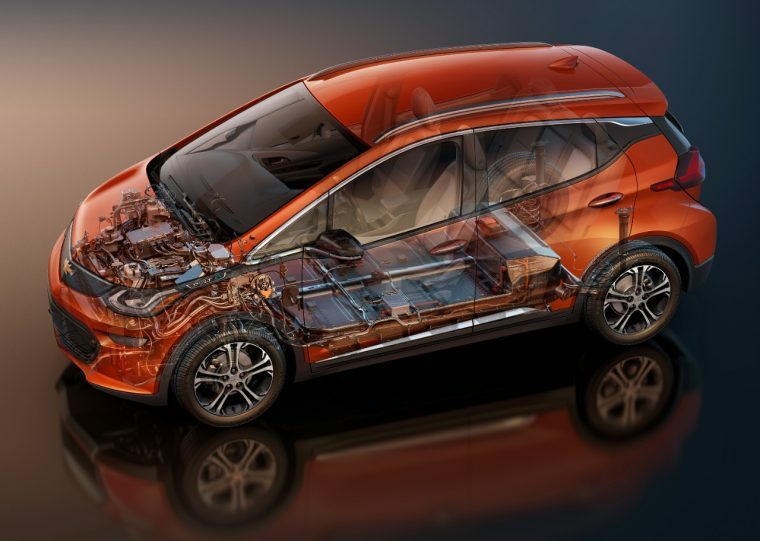 What’s New for the 2017 Chevrolet Bolt? The 2017 Chevy Bolt is a completely new model–the very first over-200-mile-range, mass-market-priced electric vehicle. This EV is coming to market in America, Europe, and China (although in Europe it will be the Ampera-e) as a crossover utility vehicle, which is a vehicle, built on a car platform, that combines features from both SUVs and passenger cars. The Bolt will come in two trim levels: LT and Premier. It also comes with four optional packages: the Driver Confidence Package, the Comfort and Convenience Package, the Infotainment Package, and the Driver Confidence II Package. The Driver Confidence Package comes available for the LT trim and standard on the Premier, and includes Rear Cross-Traffic Alert, Side Blind Zone Alert with Lane Change Alert, and Rear Parking Assist. Next, the Comfort and Convenience Package also is available for the LT and standard on the Premier, and includes heated driver and front passenger seats, a 3-spoke leather-wrapped heated steering wheel, and an auto-dimming inside rearview mirror. The Infotainment Package is only available for the Premier, and includes a Bose premium 6-speaker system, wireless device charging, and 2 USB charging ports for the back seat. Finally, the Driver Confidence II Package is only for the Premier trim, and only for those that also got the Infotainment Package. It includes Low Speed Forward Automatic Braking, Lane Keep Assist with Lane Departure Warning, Forward Collision Alert, a Following Distance Indicator, Front Pedestrian Braking, and IntelliBeam headlamps. One big thing to note is that GM has promised that at some point Bolt owners will be able to turn efficiency into a game, where they can each compete with one another to achieve the greatest distance per energy used. The exterior of the Bolt takes much of its styling cues from its big brother, the Chevrolet Volt (with a V). The front features a split grille (which is actually sealed, since as an electric, the Bolt doesn’t need a radiator), the sides sport two sharp body lines, one of which traces a line to the taillights. 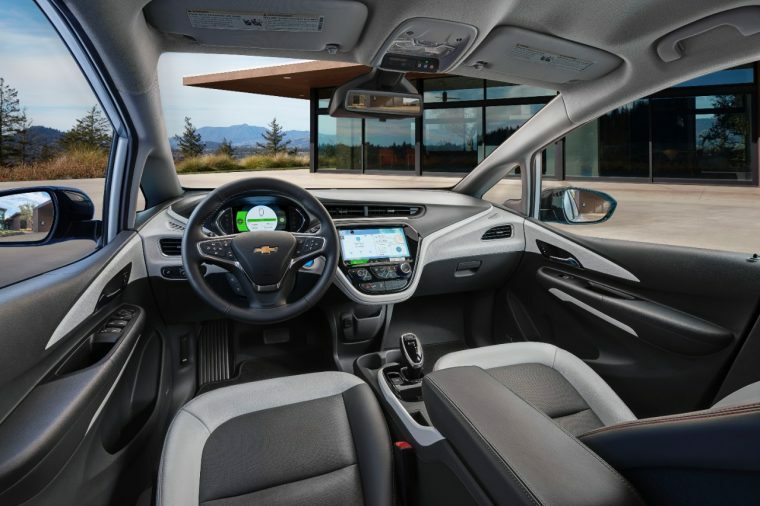 Also like the Volt, the Bolt features a charging port door behind and above the driver’s-side front wheel, and the vehicle’s name on a black strip in front of the side mirror. The Bolt also sports the Chevy logo on a black field on the rear. The Bolt does have style of its own, of course. Black panels connect the front headlights to the rear hatch, while the windows arch high to encompass the Bolt’s increased interior space. A chrome strip runs a course from the mirror-integrated turn signals and sweeps over the top of the windows, while the top doesn’t sport the Volt’s reverse mohawk and the much-shorter nose only carries a few sculpted lines. Finally, the underbody of the Bolt is flat and enclosed, since batteries don’t need air to work. The Bolt is propelled forward by an electric drive unit using an Electronic Precision Shift transmission, which together deliver 200 hp and 266 lb-ft of torque. 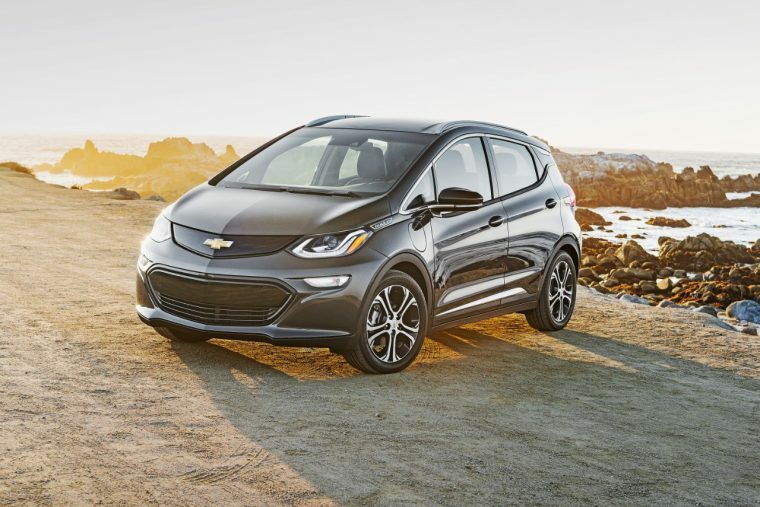 This gives the Bolt, despite its higher form, a 0-to-60 time of less than 7 seconds, according to Chevy, with 0-30 achieved in 2.9 seconds, with a top speed of 91 mph. For those driving in traffic, though, the Bolt also offers multiple driving modes, two of which increase the car’s regenerative braking to the point where you can (most of the time) drive only using one pedal. The Bolt is equipped with a battery pack of 288 lithium ion cells, delivering 60 kWh of electricity for a total range of 238 miles, depending on how you drive and the conditions (easier driving will deliver more range, and aggressive driving will deliver less). 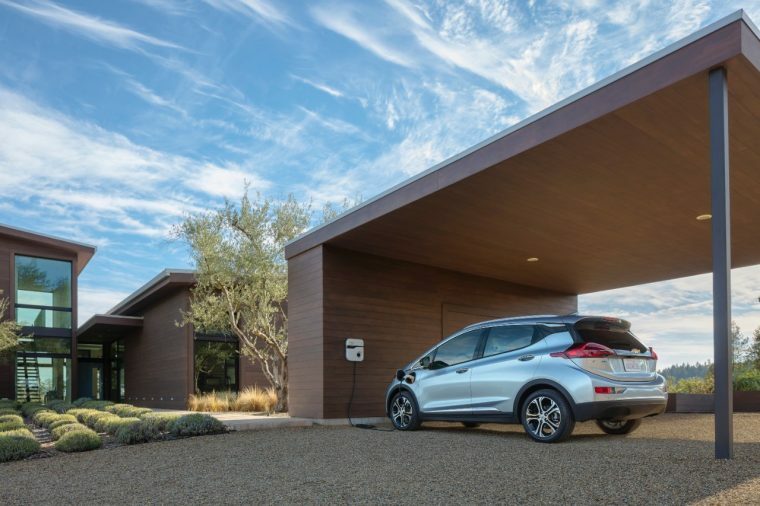 Chevrolet has said that the Bolt will recharge from the usual 50-mile commute using the available 240V charging in under 2 hours, or about 25 miles per hour of charging. That means that if you somehow run this car out of electricity, push it into the garage, and plug it in to a 240V charger, it will fill to full in about 9.5 hours. Using the available DC fast-charging port, that time becomes 90 miles in a half-hour. If you want to think of that in terms of MPG, the EPA has given the Bolt at an MPGe rating of 128 in the city, 110 on the highway, and 119 combined. 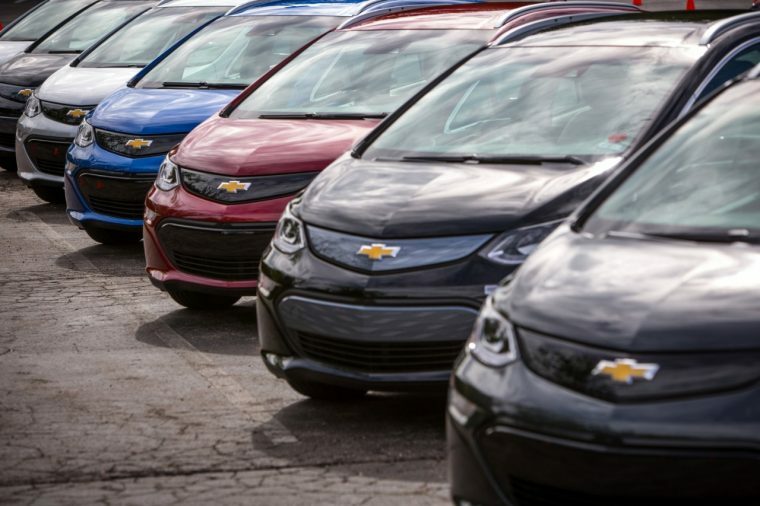 The EPA estimates that the Bolt will cost only $0.92 to drive 25 miles, with an estimated annual fuel cost of $550. For comparison, the 2017 Chevrolet Cruze, which has excellent fuel economy at 30/40/34 mpg city/highway/combined, costs $1.64 per 25 miles with an estimated yearly fuel cost of $1,000. Inside, the Bolt also takes styling cues from the Volt, including the same steering wheel and a very similar informational display. However, from there the differences begin, with a larger touchscreen, a flat back seat, and increased interior volume due to the rear hatch and under-floor battery. As the Bolt has not begun deliveries (but will soon! ), neither the NHTSA nor the IIHS have been able to assess and publish crash test scores for the Chevy Bolt. However, the Bolt will be equipped with a 10-airbag system as well as Chevy’s Teen Driver system, and in the Premier trim includes standard a number of active safety systems like Rear Cross Traffic Alert and Side Blind Zone Alert. Additional systems like Front Pedestrian Braking and Forward Collision Alert are available options.